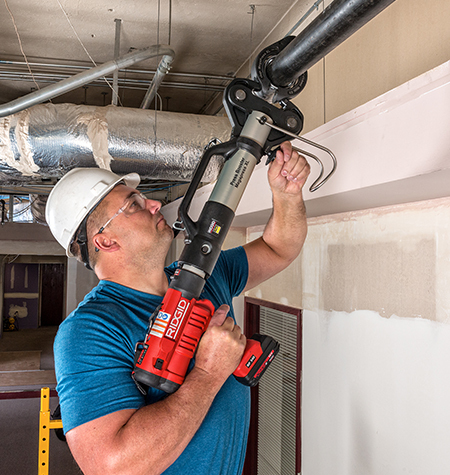 The RIDGID Press Booster: Connect up to 4" of steel pipe in seconds. Press-In Branch Connector Tool Kit New! MegaPress® Jaws & Rings join ½" - 4" commercially-available Schedule 5-40 steel Pipe when used with Viega® MegaPress® Fittings. For use with Viega MegaPress,® MegaPressG®, MegaPress® Stainless, and MegaPress CuNi Fittings. Press connect ½” -3/4” Steel pipe with RIDGID Compact Press Tools. Press connect up to 2” steel pipe with RIDGID standard Press Tools. 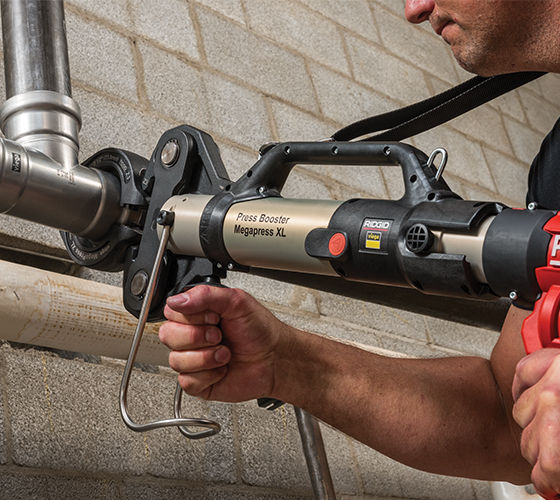 Increase the output of RIDGID standard tools to enable press connection of 4” steel pipe with the New RIDGID® Press Booster. Zero threading required. No need to carry heavy equipment or worry about metal shavings or cutting oils to slow you down. 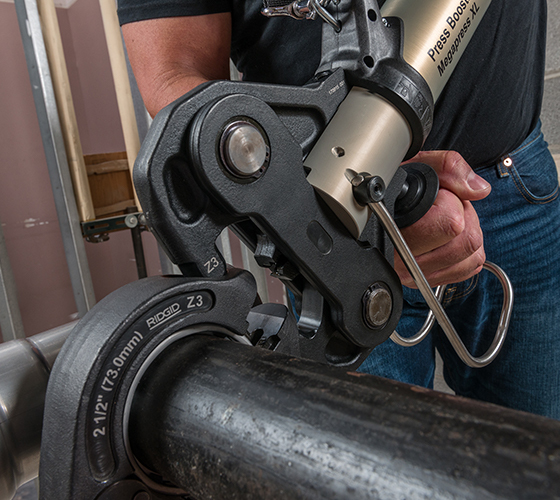 Press up to 2” steel pipe in 5 seconds and up to 4” in under 25 seconds. Jointly developed and tested with Viega® MegaPress® fittings. An internal processor in the RP 340 confirms a perfect press every time. Viega Smart Connect™ technology reduces callbacks by ensuring every fitting is pressed properly. RIDGID Press Tools, Jaws, Rings and Prep Tools are built for the most demanding applications and are backed by the RIDGID Full Lifetime Warranty. "Viega’s MegaPress XL and RIDGID Tools Press Booster tool might be the most innovative of all."